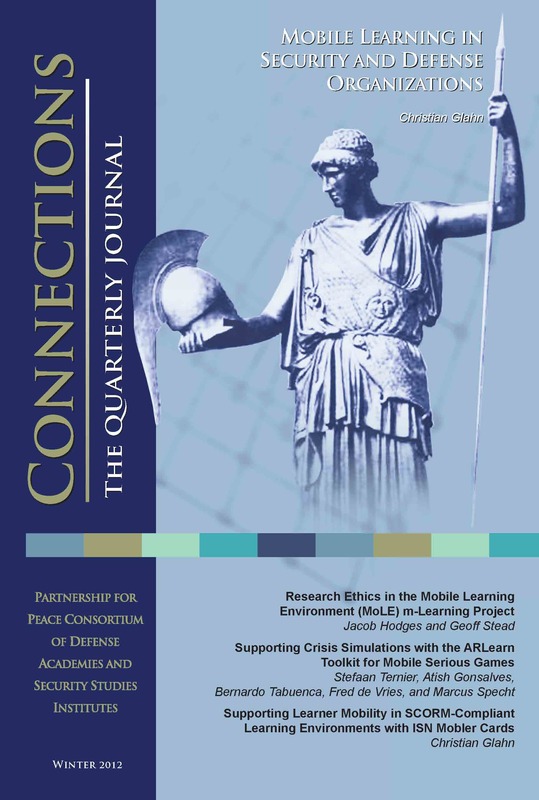 The Winter 2012 issue of Connections is dedicated to the technical and organizational challenges of mobile learning, the opportunities it provides in the education and trainig of defense personnel, and the challenges of mobile learning in security and defense organizations, research ethics, crisis simulations and mobile serious games. Another article provides analysis of the experience in teaching history in an ethnically divided, post-conflict country. Glahn, Christian. "Mobile Learning in Security and Defense Organizations." Connections: The Quarterly Journal 12, no. 1 (2012): 1-3. Hodges, Jacob, and Geoff Stead. "Research Ethics in the Mobile Learning Environment (MoLE) m-Learning Project." Connections: The Quarterly Journal 12, no. 1 (2012): 5-15. Ternier, Stefaan, Atish Gonsalves, Bernardo Tabuenca, Fred de Vries, and Marcus Specht. "Supporting Crisis Simulations with the ARLearn Toolkit for Mobile Serious Games." Connections: The Quarterly Journal 12, no. 1 (2012): 19-29. Glahn, Christian. "Supporting Learner Mobility in SCORM-Compliant Learning Environments with ISN Mobler Cards." Connections: The Quarterly Journal 12, no. 1 (2012): 31-43. Murray, Kristy, Peter Berking, Jason Haag, and Nikolaus Hruska. "Mobile Learning and ADL’s Experience API." Connections: The Quarterly Journal 12, no. 1 (2012): 45-49. GAO, U.S.. "GAO Report on Higher Education: Use of New Data Could Help Improve Oversight of Distance Education." Connections: The Quarterly Journal 12, no. 1 (2012): 65-101.